CSM MA Performance Design and Practice graduate Irene Ros reviews two of the late Nekrosius' shows during a recent visit to Vilnius, Lithuania. Eimuntas Nekrošius (1952 - 2018) was a renowned Lithuanian theatre director. He was only around 30 when he was first mentioned in a textbook about theatre in the URSS. He was defined, by scholars and academics, as a “primitive” director, in referral to his employment of objects which don’t illustrate but evoke the four elements. Cinkas is a show based on Svetlana Alexievich’s (2015 Nobel Prize in Literature) Boys in Zinc (1991) and on her Voices from Chernobyl (1997). The first is a book recording the testimonies of witnesses of the Afghan War (1979-1989): Russian veterans, mothers and wives of soldiers who died in the war. Through the testimonies, Alexievich describes the Afghan war as an ‘unnecessary carnage’. From a reader’s perspective, it is very clear that the writer edited the stories, but, despite the fact that her point of view is explicit, there is no blame on the veterans or their families. The book tells us about the people who were raised to believe in ‘an ideal’, without questioning the strategies to reach the goal. It tells us about somebody’s refusal to believe they were mutilated or that their beloved died for unspoken reasons, or someone who questions: “One must not love his own people, to send him to face such things”. The ‘Nekrošius’ show begins with a young Svetlana, full of passion and determination. We are soon catapulted into an airport scene where soldiers are leaving for Kabul. We can see them in the helicopters and hear the shots of the machine guns, recreated with a sheet of zinc. It is the same zinc that is used to fabricate cheap coffins which are used to send home the remains of the soldiers’ bodies. At the airport, Alexievich holds a banner with her telephone number on and carrying a huge recording machine. 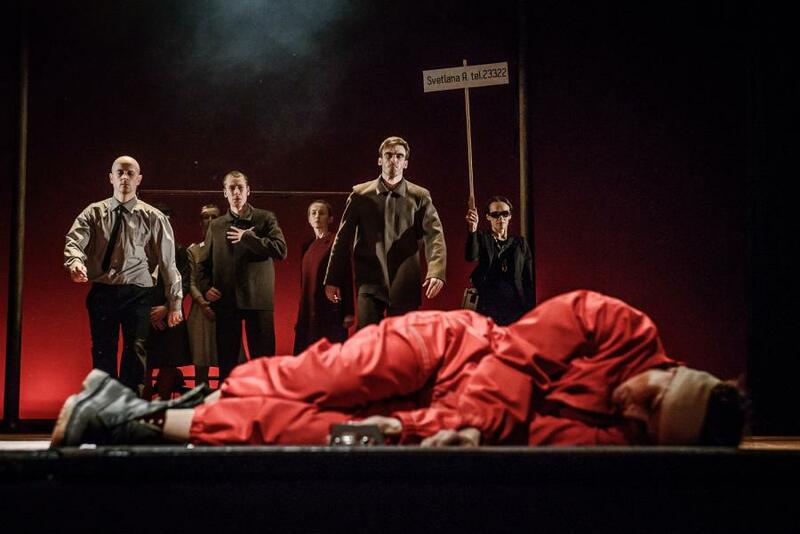 Alexievich’s costume contrasts the other members of the cast which help represent her individuality. She wears a black suit, whereas the other women wear dresses and the men wear greyish uniforms. The first woman to be interviewed is quite literally pinned to the wall by the writer. Alexievich holds her with one hand, but it is the woman keeps the writer’s hand on her chest once Alexievich let go. Nobody is pure or innocent in Cinkas. Not the writer Svetlana Alexievich, who flirts with young and vane veterans to get a story out of them, nor the men and women who accuse Alexievich to falsify their stories, thus defaming them and the whole Russia. When it is almost time for the interval, an officer invites the audience to leave. 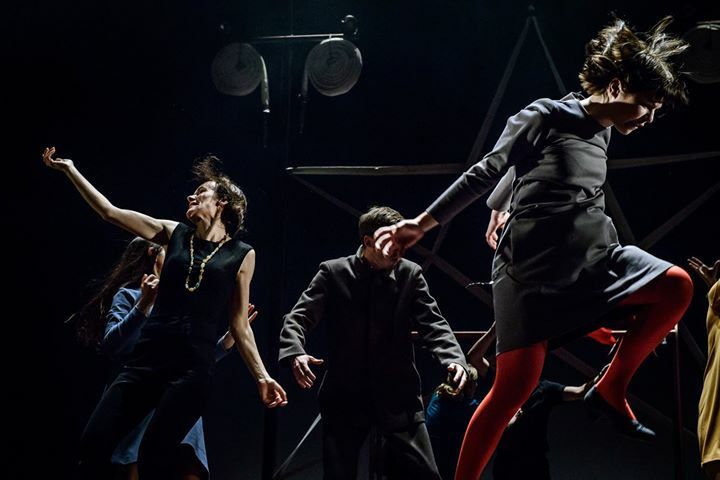 The stall doors are open, the lights in the entrance hall are switched on, but when someone shyly tries to leave, they are shouted to sit down as though the audience is part of the play. Part II is mainly composed by the testimonies of the accusing parts in the trial to Boys in Zinc. The writer’s privileges are always questioned: at the airport, Alexievich easily gets all the tickets she wants by showing her books, the others struggle to get what they need. During one of the hearings, Alexievich told a mother: “They started again to deceive you and manipulate you. Again. Didn’t you say, back then, that you would let them deceive you again?”. In the show, the writer does not reply with words, she just mimes a head explosion, or she turns a noose into a window, from which she playfully waves her hand. Did she lose her mind? Is she mocking all of them? The court is turned by Nekrošius into a game. The accusing parties pitch, one by one, their version of their stories. In between testimonies, the choir rises and sings Olé, as they would in a stadium, erasing their individualities. 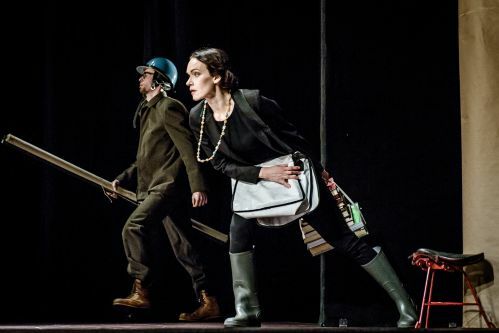 As always, in Nekrošius’ shows, Nadežda Gultiajeva’s set is a whole layer that could tell the full story with images. The chairs the accusers are sitting on are wrapped in bandage. They are the war wounded, they shout out the pain, the suffering. They tell us that, no matter what the people sitting on them is claiming, the war broke them. "I'll stay here" are Alexievich’s last words and the ones that end the show. Bado Meistas (A Hunger Artist) is a Franz Kafka’s ten pages short tale. It tells the story of a man whose art is fasting. Unfortunately, it is an art that is quickly subsiding. Even at its highest, the audience lose interest after 40 days. The artist becomes unemployed and purchased a circus, where he continues fasting for ‘art’. After 40 days, the circus’ staff forget about the artist and don’t update the number of days he has been fasting. Nekrošius’ hunger artist is a woman, the flawless Viktorija Kuodytė. 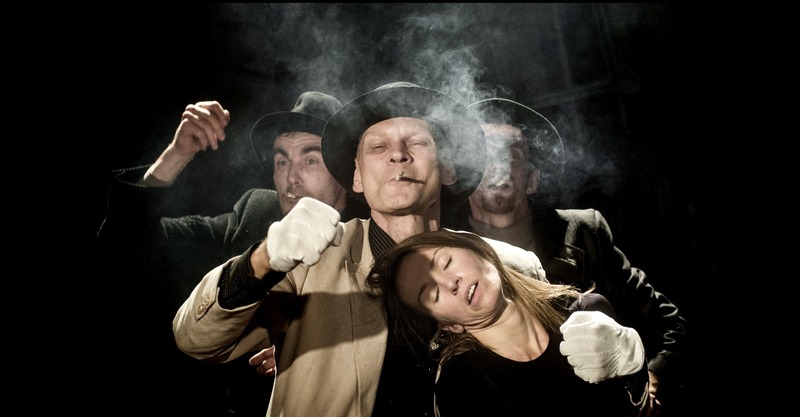 With only 4 performers, Nekrošius tells Kafka’s tale in a third person, as in the book. The second artist is not imprisoned in a cage, but in a space created by the relationships with the other performers, who play multiple roles, such as the artist’s audience, the impresario, the circus’ staff. Kuodytė displayed the artist’s frustration and his rage for an audience that does not endorse his commitment to his art. She shows us the carnal love of the artist for a job that is not by choice. The alienation and existential anxiety are filtered with a Kafkaesque irony that the performers translate into absurd actions. When the artist is forced to leave, we see his journey into a cheap taxi filled with cigarettes’ smoke. She holds a little wooden platform with a pair of shoes glued on it. She throws it around and then she fits her feet into the shoes. Wherever the artist goes, the platform will follow, in turn, restricting his freedom. The circus set was built with a crane made of a very light bookshelf of which the performers can climb and attach other props to. The crane rotated at various points in the performance, almost above the first few rows of audience. I have followed Nekrošius’ career for a long time, I wrote my BA dissertation about him. When I flew from London to Vilnius, I had no idea what I was coming here for or what to expect. Nekrošius’ performances have been described as symbolic, as scores, but what I faced here is that his portraits of humanity was the reason for choosing Vilnius, these portraits are Nekrošius’ true talent. I flew to Vinius because of this is a very rare talent, something you can’t gain from just mastering a technique. No matter how many formally perfect shows I have seen in London in the past 6 years, this is a unique art. Cinkas portrays the inner conflict between being an individual and being part of a mass. Sitting on the war wounded chairs, each of the actors has not only a different intention but a different spirit. They are a collective of individuals that the Soviet Union failed and likely the reason it did not survive. With Nekrosius' death, we all became poorer. And we will learn less about ourselves. You can read more about Irene Ros and her own practice by visiting her website. Valentini, Valentina (1999). Eimuntas Nekrošius. Catanzaro: Rubettino.